Create your family, team or group budget. Share your data with your friends and publish reports. Adjust the guides on your own. Use tags and lists of third parties to ensure flexibility for the debts and gifts. All movement of funds in dozens of handy charts and graphs. 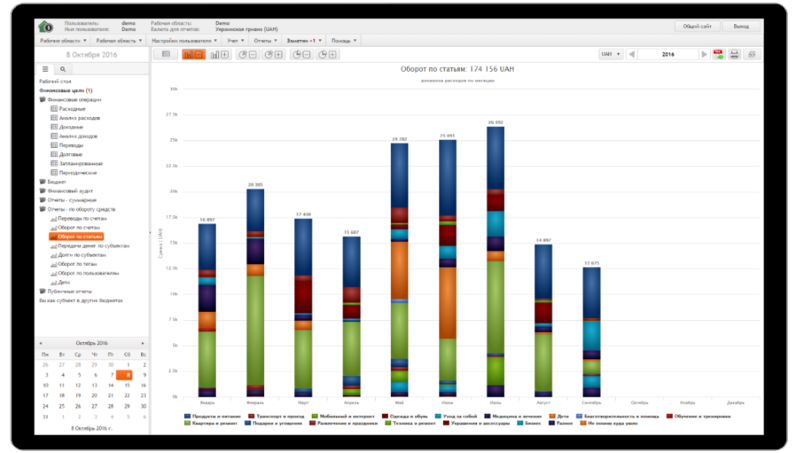 Create your own graphical reports and customize them for yourself. Use with stationary computers, mobile and tablets. Convenient intuitive interface is clear to everyone. Save reports in Excel and PDF. Print graphics and analytics. Receive regular backups of all your data in the mail. Data encryption, secure connection to the server, daily backups of all data on the backup drive and into the cloud. Create reports and publish links to them. Public reports can be viewed by anyone who has a link to this report. Picking up the system "for ourself" we examined more than a dozen top online systems on the market and concluded that they all contain a certain dignity and unfortunately lacks: do not know how to work correctly with different currencies, do not contain tags, no children articles, weak accountability, no normal accounting for debts, no widgets, the interface is completly outdated, rising prices, no proper support, etc. Then was born an idea to create a service that would bring together a stable pricing policy, innovation in the management of personal budgets and strengths of other systems. We are a team of personal finance experts, open to new and constantly strive to improve the quality of services. * - Workspace uses the tariff plan of its owner. All workspace's users works using the tariff plan of the workspace owner. ** - The price is final. All payment systems fees are paid by the seller. One of the best services for the Russian-speaking audience. Use it by myself and recommend to friends. Simple and convenient service that is easy to keep my home budget. Now all finances at a glance. I use the system for a long time. The system justifies my expectations and even exceed them. Powerful reports visualization and customization system. I can say with confidence I found what I was looking for! Due to public reporting and operations auditing are ideal for a religious community.